Another LA episode! Which means their Asian cop body will be back, please? Before we get to the police response, however, it's time for a teaser kill! This one involves a cab driver talking about how the stench of filth pervades the disgusting modern world. At first it seems like we're in for a Bickle-style vigilante, until the man reveals that he was talking about a literal 'smell' by taking out a small bottle and soothing himself with a whiff from it. A woman then asks for a cab ride, which he refuses to give (off-duty, you see) right up until he smells her, and decides that she too must become one of his victims! Will he use her corpse to make more perfume? I'm guessing yes, since it's likely that the writers of this episode have seen 'Perfume'. Anyhoo, it's time to check in with Emily, who's apparently on her way home after getting that bad news from Angus MacFayden last week involving their mutual enemy escaping from a Russian prison. She goes inside and gets an envelope out of a safe - it contains files, passports, a memory key and a CD. Is Emily a double-agent? No, apparently she's a former spy, who used to work on some kind of an international team with Angus, a woman I've never seen before, and Sebastien Roche! So yay! More guest stars! She flashes back to a scene where the villain who prison-broke looked on from a villa while she was escorted into a towncar by men in suits. Did he figure out she was undercover and then try to have her killed, but then she escaped, and now he's back to finish the job? That's more of a prediction than a question, actually. There's a brief tense moment when she notices that her cat was recently outside in the rain, having used a window she didn't remember leaving open. After confirming that it was her catsitter that was responsible, she's a little less frightened, but then a mysterious phone call goes and kills that, so she puts glass things on every window and a table by the door, so that if anyone tries to get into her apartment she'll be scared into waking up. Then she decides to spend all night in a chair pointed at the front door, gun in hand. Which is a much better way to ensure her safety than by bringing in whatever agency she worked for, or her friends at the FBI. Or, you know, spending the night literally anywhere but her apartment. Emily shows up for work late the next day, and deflects questions about her night. Which suggests that yes, she's going to be keeping the fact that her life is in danger a secret for some reason. Anyhoo, it's 'lay out the case time', so the team finds out that three women have been murdered in the past two weeks (because all killers are spree killers), drowned in methanol and then dumped in alleys. Also he removed a square of skin from their feet for some reason. The team wonders what he's doing with the women - luckily we're shown in the very next scene, lest any tension build, as we watch the killer brewing his perfume from some sort of an alchemical setup. On the plane the team jumps onto the the biggest clue they have - could a guy really buy enough methanol to submerge a body in without drawing any attention or leaving a blinking, illuminated trail leading to him? Probably not - especially since he's probably using a fresh tub each time, assuming that he's creating a new perfume from each victim. We get a sense of just how incredibly out-of-touch the killer is in a couple of short scenes. A continuing bickle-monologue lets us know that he's sick of the chemical smells of the city, which takes care of the 'tell' part of the old screenwriting adage. The 'show' follows quickly after, with the killer ejecting a woman from his cab because she smells of cigarettes and modern living. I'm disappointed to discover that Greg and Joe meet some random white guy at the police station, meaning that their pal is once again absent. A trip to the morgue gives us very little new information - yes, they were soaked in alcohol for a while, but no, there wasn't any medical knowledge necessary to commit the crimes. They also discover that the women were subdued with chloroform which had been aerosolized, which Greg signals as been important evidence of pre-planning. As if popping drugs into a spray-bottle somehow required more time and effort than preparing bathtubs full of alcohol to drown your victims in. A 'geographical profile' reveals that the killer is picking up the victims in hugely disparate areas across LA, then dropping them all within a very close radius downtown when he's done with them. When they check the locations against the times the victims were abducted, a clear pattern emerges: The need to find someone who wouldn't look out of place driving all across the city at all hours of the night. So either a cop or taxi driver. Cross-referencing those against chloroform and methanol purchases should narrow that list down incredibly quickly. It seems the methanol list was going to be unmanageably huge, since it's not a tightly-regulated substance. Of course, it seems like it still would have been worth checking into private citizens buying huge amounts. Meanwhile, the killer abducts another woman, this time in broad daylight. Turns out that he's rigged his cab to shoot a gas into the back seat, while he's safe in the airtight front compartment. Because there's nothing less suspicious than a woman freaking out in the back seat of a cab, surrounded by a thick mist. That would go completely unnoticed in LA, I'm sure. So why does it always sound like she's using a manual typewriter? While this searching is going on, the killer has brought his latest back to his lair, and I can only assume that this is going to go as poorly for her as it does for all mid-show victims. Garcia then phones the team back with her news, and it's the Prentiss Award-winning line of the night. So during the three hour period when the bars were closing and movies were letting out, not one person took a cab from downtown Los Angeles. Do you even hear what you're saying, Garcia? How can you read these lines with a straight face? Although this absurd piece of evidence does lead them to conclude they're dealing with a fake cab! While the rest of the team goes out to start the profile, Reid takes Greg aside and announces that he's figured out what the cut-out squares of skin mean - scientists will often cut out a piece of the material they've been doing experiments on and use it for cataloging purposes. So what if the guy's a scientist, or at least someone who thinks of himself as one! But first, something odd happens. The killer torments his latest victim by confronting her with the corpse of his last experiment. Which raises the question - when did that happen? He kidnapped the last women two days ago, and dumped her body yesterday. Now he's got a fourth woman in the tank? Did he kidnap her at the exact same time as he was dropping off the last body? Why hasn't this missing woman been mentioned? Yes, they've made it clear that it can take a while for missing persons reports to go through, but with three young white women missing in two weeks, you'd think they'd prioritize any new calls fitting that basic description. The one upside? This new woman may count as the mid-episode victim, massively increasing our current victim's chances of survival! The team gives the profile - but since local cops never help save the day, let's move onto the important thing: they put the description out to the public immediately, in exactly the way they didn't with the spree killers last week! This proves a smart decision, since the woman who was ejected from the cab earlier in the day calls the cops! She lets them know about the guy's monologue, and at same time the latest victim is reported missing! Emily and Derek have a scene of hopping into a cab, hoping to figure out how the killer is choosing his victims. 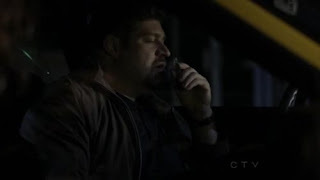 They pause for a moment while Derek tries to ask about Emily acting strange 'over the last few days', which is a strange thing for him to say, since she only found out about the escaped criminal last night. And she wasn't acting particularly odd on the road while tracing the spree killers, which accounts for the two weeks before that. Then they jump to the conclusion that the killer must be deciding on his victims based on smell. They have no reason to think this, of course - cab drivers both talk to and look at their passengers when they get into the cab, so there's no way they could possibly eliminate that possibility. Still, the mere mention of smell lets Reid clue to the fact that methanol can be used to capture smells for perfumery, which moves them right along. As usual, Garcia then solves the case for them, checking methanol, chloroform, and lab purchases against one another gets them a single name. So it's off to arrest the killer! Who is, at that very moment, lowering a woman into a tank of alcohol! Here's a disturbing fact - in addition to the perfume for his private consumption, he was also turning the women's smells into candles. So, you know, ick. They get there just in time to stop him from killing the woman, which leads to a car chase through the warehouses of Los Angeles, at the end of which the killer cuts off his own head by ramming to an I-beam that was chained to the back of a flatbed. It's actually a very accomplished chase scene, with plenty of cars, a 'wrong way down the street' sequence, and the aforementioned crash. Combined with the two explosions so far this year, I've got to wonder if the show was given a much bigger budget this year - or is it just the savings generated by firing JJ (and apparently all their writers)? With the state saved the millions of dollars his trial, incarceration and execution would have run, the episode comes to a satisfying END. Other than a few more minutes with Emily, who arrives home to discover a gift waiting outside of her door. Even though the man out to get her is Irish, and stereotypes would suggest that he's an IRA guy who's familiar with bombs, she picks up the package and heads into her apartment. Alone. Without letting anyone know that someone who's out to kill her might well be waiting right inside the door. While Emily searches her apartment with her gun Reid calls, inviting her to a movie that night. She declines and opens the package instead - it contains the same kind of flower that she grew at the villa from the flashback! Which seems to have been in Italy, based on the language of her abductors. Although she's speaking french, so who knows? She was undercover, though, since the IRA guy calls someone to let them know that his girl was dragged off by a government agency before being arrested by the selfsame men. This present (and flashback) finally proves threatening enough to drive Emily out of her house, and hopefully into telling people about the Irish murderer out to get her! Or at least get Angus to help her out! Again they deserve a bit of partial credit here, since they figured out the possible uses of methanol included science, and added various flasks and retorts to their search terms. Of course, that guess could easily have been wrong, and they might well have eliminated one of their suspects. They knew that a guy was using chloroform, drowning women in a big tank, and buying enormous quantities of methanol to do it. That can't have been a long list of people to track down. 4/10 - Hey, I just noticed that Rachel Nichols wasn't in this week's episode, and unlike last week, they didn't even bother mentioning her disappearance. Is that it for her? Was she just a brief experiment that they immediately backed out on? Also, I feel sorry for the actress whose entire part was lying naked and soaking wet on the slab. Didn`t even get a line before being killed, meaning no extra cash thrown her way. I'm pretty sure this is an homage to the book/movie "Perfume." At least in its most basic of plot - very little cannibalism this time around.